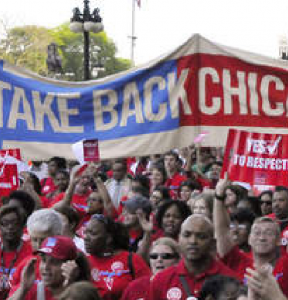 As educators get ready to strike second Chicago charter operator on February 5, union to also outline strike scenario. CHICAGO—No parent would trade their child’s well-being for a cash payoff, and CTU members at four unionized CICS schools plan to deliver a public message to management on Friday that educators won’t accept that kind of deal at the expense of their students either. Educators will hold a press conference at 7:15 AM on Friday, February 1, at CICS Wrightwoodelementary school, at 8130 S. California, to announce their formal response to management’s latest ‘offer’, as rank and file members brace for a Tuesday strike. The last scheduled bargaining session with management before the CTU’s February 5 strike date is Friday. The CTU has been bargaining for months for a new contract with CICS management. Demands have anchored around reducing large class sizes, better compensation for low-wage paraprofessionals and teachers, and more adequate staffing of critical personnel, including counselors and social workers, for their overwhelmingly low-income students of color. Management has responded by offering teachers a significant step toward equal pay for equal work with their peers at CPS schools—but only if educators agree to even larger class sizes, the elimination of paid parental leave for all staff, minimal pay increases for low-wage paraprofessionals, and cuts to critical programs, including social workers and counselors. Staffing shortages and corporate cost-cutting at some schools are so critical that management has posted paraprofessionals—not subject-trained teachers—to chaperon online classes for students in subjects like Spanish. CICS management has siphoned off than $36 million in public funds for ‘reserves’—including almost $20 million that management invested with a company owned by CICS co-founder and former president Craig Henderson. The charter operator is notorious for creating redundant layers of management that drain upwards of 30% of the public dollars it receives away from classroom needs. Besides CICS’ cash hoarding, management has used those exorbitant fees to swell the ranks of pinstripe patronage bureaucrats. In 2017, four top CICS bosses earned six-figure salaries— including CEO Elizabeth Shaw. Today, that number is 14. 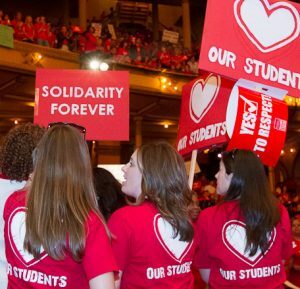 Based on CICS financial audits, it’s estimated that it would cost management less than 10% of the cash they’re currently hoarding to save the jobs of counselors and social workers, cut class sizes and end high staff turn-over and the disruption that causes for students’ lives by providing educators with equal pay for equal work with CPS-run schools.